What better way to work on your standing balance than to use Pilates principles and standing exercises to help you stand taller and with more confidence. I have found some good leg exercises to be those that incorporate standing on one leg while mobilizing the other. I like to begin and end all of my Pilates mat classes with some of the standing Pilates balance exercises to help the students feel more aware of where they are in space , and also more grounded. 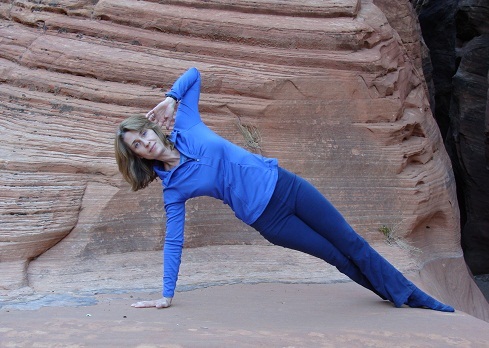 I recently was hiking in the Vermillion Cliffs of Northern Arizona and Southern Utah and I came across this beautiful setting where I decided to try some of my Balance exercises. Here they are for you to try on this video we took! I enjoy teaching the Standing Pilates work because you can really see a difference in the students progress from the beginning of a class session until the end. Most people feel very intimidated and frustrated at times trying some of these balance exercises. Try using a chair or wall to hang on until you are comfortable letting go. You should notice after about 3-6 sessions your balance will improve and so will your confidence in the way you look, move, and feel! 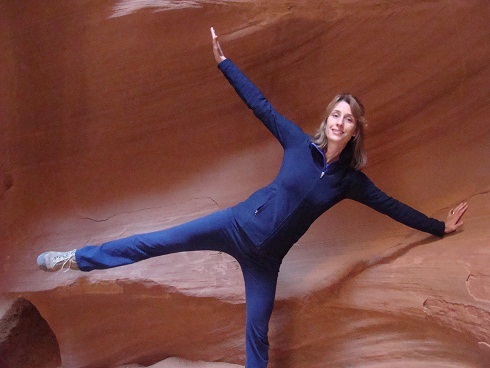 I enjoy practicing these standing Pilates exercises wherever I go... here I am in the upper Antelope (Corkscrew) Canyon. If you have trouble balancing just grab the wall like I did here shown above. Or...grab the rock and bend all the way over for a nice side stretch below. These standing balance exercises all have one thing in common...core strength! If you use the Pilates Principles and sound instruction you will have a better awareness of your center of balance, right around your navel. With that, you will achieve better balance in a variety of positions, to keep your Posture Perfect! Leave standing balance exercises and find out more about how Pilates exercises can benefit you!